Remember, only 59.2 percent of the US population is working and only 56.5 percent in NC. More on NC and McCrory’s state of the state speech soon. From Challenger Gray & Christmas. “Job cut announcements surged to their highest level in nearly two years, as falling oil prices prompted cost-cutting efforts in energy and related industries. In all, U.S.-based employers announced plans to shed 53,041 jobs from their payrolls to start 2015; with 40 percent of those directly related to oil prices. The January total was up 63 percent from the 32,640 planned layoffs announced in December, according to the report on monthly job cuts released Thursday by global outplacement consultancy Challenger, Gray & Christmas, Inc.
Last month’s figure was 18 percent higher than the same month a year ago, when employers announced job cuts totaling 45,107. Last month, in fact, saw the highest monthly job-cut tally since February 2013 (55,356) and the highest January total since 2012, when employers announced 53,486 job cuts to begin the new year. Of the 53,041 job cuts announced in January, 21,322 were directly attributed to the recent and sharp decline in oil prices. Most of these cuts occurred in the energy industry, where employers announced a total of 20,193 layoffs (19,722 of which were directly attributed to oil prices). The January total is 42 percent higher than the 14,262 job cuts announced by the energy industry in all of 2014. Falling oil prices also contributed to job cuts in the industrial goods manufacturing sector, where companies supplying products and materials to oil drillers were forced to shutter operations. These firms announced 4,859 job cuts in January, of which 1,600 (or 33 percent) were due to oil prices. From the US Labor Dept. February 5, 2015. This entry was posted in Barack Obama, Citizen News, Citizens for the truth about Obama, CitizenWells, Economy, Employment, Jobs, Lies, Obama, Obama administration, Obama lies, Obama Nation, Obama records, The Case Against Barack Obama, Unemployment and tagged 40 percent due to falling oil prices, 53000 job cuts, Challenger Gray & Christmas January 2015 job cuts report, Initial claims jump 11K. Bookmark the permalink. The low information investors are reacting favorably to today’s news. While the country is busy blaming the measles outbreak at Disneyland on the official story line that it came from “overseas,” and the main stream media is pushing the agenda of vaccination, blaming the outbreak on the statistically insignificant number of Americans who refuse to vaccinate their children, the media is deliberately ignoring the ELEPHANT in the room, the illegal alien children who were bussed in and flown in continuously since last year by this corrupt administration from countries where measles is endemic because of lack of vaccination and poor or non-existent healthcare. You don’t have to be a rocket scientist to figure this one out ! So…please point the finger in the right direction to place blame. Senate Minority leader, Harry Reid’s brother, Larry Reid, 73, arrested for DUI, assaulting an officer and possession of a gun while under the influence. After spending the night in jail he was released and a criminal complaint has not as yet been filed. Senator Reid’s office confirmed that Larry is the Senator’s brother but would not comment on the arrest. The 73-year-old brother of Senate Democratic leader Harry Reid has been arrested after allegedly driving drunk and fighting with police officers. 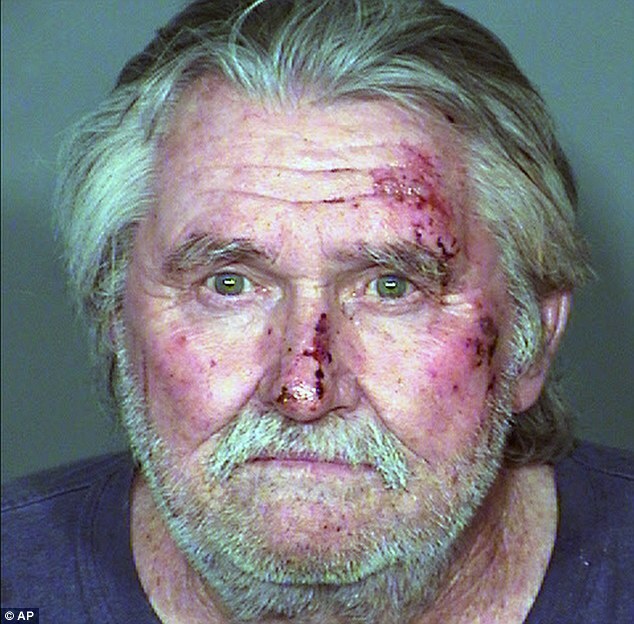 Larry Reid was arrested after being found in a parked Lexus SUV in the dirt median of a state highway in southern Nevada, the state his brother represents. He faces misdemeanor charges of driving under the influence, battery on an officer and possession of a firearm while under the influence of alcohol. He was also cited for not wearing a seat belt. He was released after spending the night in Clark Country Jail. Reid and his car were on a stretch of U.S. 95 inside the Boulder City limits, about 25 miles southeast of Las Vegas. Nevada Highway Patrol Trooper Loy Hixson said the car, which the trooper on the scene originally believed to be broken down, but on closer inspection found Reid inside. Come to think of it, he does look an awful lot like the infamous Dirty Harry…his face is all smashed in and he looks like he has a six-week hangover or drunk (take your pick on that one). Well, I guess that behavior runs in the family. Come to think of it….Larry would make a great democrat Senator……from Nevada…then the state would have two drunk Senators from the state ! I have always lived my life on the ‘up and up’ and have nothing to hide or be ashamed of……I love my country, and I’m sorry I cannot say the same about the ‘down low’ rascals who are now destroying it. When I write, I write from my heart, and I write my deepest feelings, hiding nothing. I put it out front as I feel it…if you like it that’s nice to know. If someone doesn’t like it, well then they don’t have to read it…..that’s just the way I feel about freedom of speech….you feel the same.. I thank you for the compliments you give me and you can be assured I will continue to write how I feel about things and post those feelings here at Citizenwells….who has been gracious enough to provide all of us that platform to express ourselves openly and without fear or retribution. I will continue to write…that is of course…as long as my God gives me the ‘common sense’ and ability to do so. I found this excellent article on Obama’s secret Iran strategy. Its a long read but worthwhile. …..if it is secret,how does anybody know about it? I read the story also. You are right it is a long read, but after reading it I reviewed it in my mind,and some key points almost immediately popped up. First of all the language tells me that the article was composed by a liberal. The comparisons made of Obama to George Bush were all weighted to the liberal mindset……which they certainly have the right to do……but I would hasten to add that it has been plain to see that Soetoro is afraid of what the world thinks,which makes him look spiritually,and morally incompetent. There was also a Brit who thought that he could REASON with the German lunatic. As Neville Chamberlain left the room,Hitler turned to one of his staff members,and said”there is the very reason why Britain will fall.” I personally think that had Neville Chamberlain been allowed to continue Britain probably would have SURRENDERED TO THE NAZIS.